So it was my birthday a couple of weekends ago, and my friends and I went to a Korean barbecue in Raleigh, Korean Grill Buffet, to celebrate! My roomie has heard some pretty good things about this place. It’s an all-you-can-eat grill, which of course gets all the guys really excited. The pricing is decent, so I was looking forward to it. 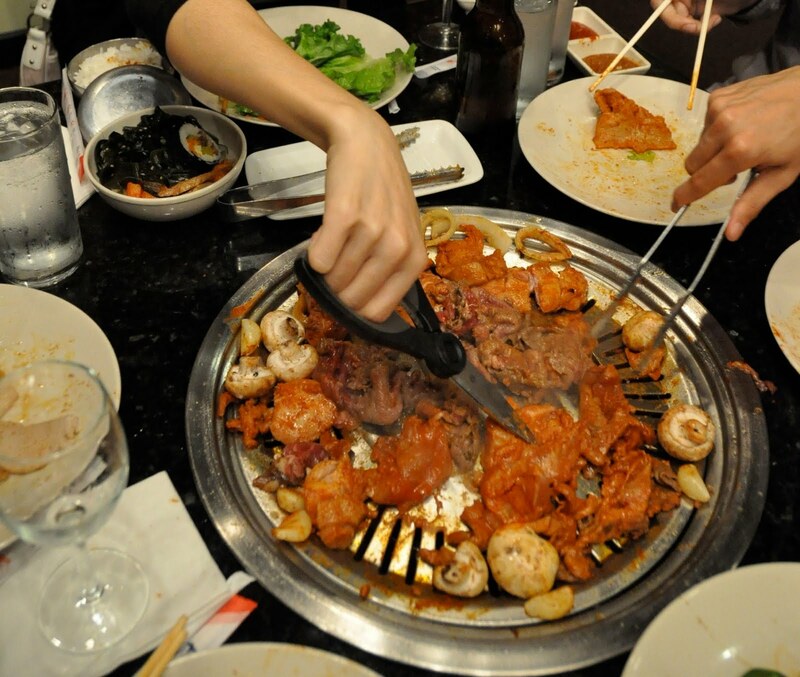 If you don’t know how Korean bbq works, basically you have a grill at your table and cook the meat at your own table. Some of the meat has been marinated already, and there is sauce available for the others. I usually make a lettuce wrap with a couple of pieces of grilled beef or pork, a small amount of rice, and tiny bit of Korean chili paste, and I eat the entire wrap in one bite. The restaurant is medium-sized with a buffet in the middle and grill tables on the sides. We had a rather large party so we took up an entire 8-person table with two grills, but if your group is smaller you’ll be pretty close to your neighboring party. The interior was overall a little too dimly lit for my liking, but the individual tables had more lighting from the overhead exhaust fan set-up. The buffet had the meat assortment at the start: chicken thighs (both marinated and unmarinated), marinated pork belly, marinated pork/ bulgolgi, and unmarinated beef. Moving on there was lettuce, different sauces and kimchi dishes, cold noodles, seaweed salad, etc. Finally, at the end of the buffet were some soups and typical Asian-style dishes like kung pao chicken and mapo tofu. None of us really went for any other of the side dishes and of course all stacked up on the meat (9 Asians, 6 of them guys.. what did you expect? ), and began grilling. Our server was helpful and attentive – changed the grilling surface regularly, replaced the shears when we accidentally took them apart, gave us another set of tongs…overall, pretty good service. As for the grill itself? It was not bad. The marinated meats had way too much flavor, which was expected – the meats were basically sitting in sauce, so they are soaking up the flavor the entire time. The bulgogi is particularly salty – the thin slices are very easily overseasoned. The unseasoned beef slices were much better, and we enjoyed those a lot. The flavoring of the pork belly was good, although it did not hold up well to the grilling because the texture became rubbery very quickly. Finally, the chicken thighs were very tender, especially the unmarinated ones, but they do take a while to cook completely on the grill, so you should be advised to cut them into small pieces for faster cooking time. Table-center grill, filled with assorted meat, mushrooms, etc. I am attempting to cut the meat pieces smaller & easier to handle. After I was satiated with meat, I decided to try some of their other offerings. Nothing in particular impressed me, although I was really horrified by their red bean soup, which was salty… I’m beginning to think that this restaurant really has a salt problem. Actually, most of my fellow diners and I believe that they’ve made a mistake and used salt instead of sugar in the soup. Whatever the case, it was quite bad. Overall, it was a decent experience. Lunch price is pretty reasonable at just $12.95 per person on weekends. (You can check out their full menu pricing on their website.) I’m not sure I’ll be coming back anytime soon, though, partly because of the drive, and partly because I just don’t want to smell like grill for the rest of my day.